What is a drumlin anyway? A gremlin with an aptitude for percussion? Seriously, a rounded, elongated hill in the Connecticut landscape is probably a “drumlin”. The best known is Horsebarn Hill on the eastern side of the UConn campus at Storrs. Landing Hill in East Haddam was in the local limelight several years ago. Lately I’ve been working on Meetinghouse Hill and Misery Hill in Franklin. The Goshen Wildlife Management Area is another. The word “drumlin” comes from Ireland, where this land form also occurs. The core of a drumlin hill is fine-textured, compact glacial debris, though bedrock may be underneath, poking through in a few places. The compact “hardpan” layer (in common parlance) may be over 100 feet thick, and dates from the prior Illinoisan glaciation (over 128,000 thousand years ago). Only the top layer, usually just a few feet deep, is sandier, looser soil, formed from the melting ice masses of the more recent Wisconsin glaciation, underlain by the compact till (scientists’ terminology). These soils are seasonally wet. Though the level summits seem, at first glance, to be well-suited to community development, they are challenging to develop, whether on drumlins or elsewhere, such as plastered onto the sides of traprock ridges. Most gently sloping drumlin hilltops in New England used to be productive hayfields, growing lushly in spring when soil moisture was available, going dormant in mid summer. 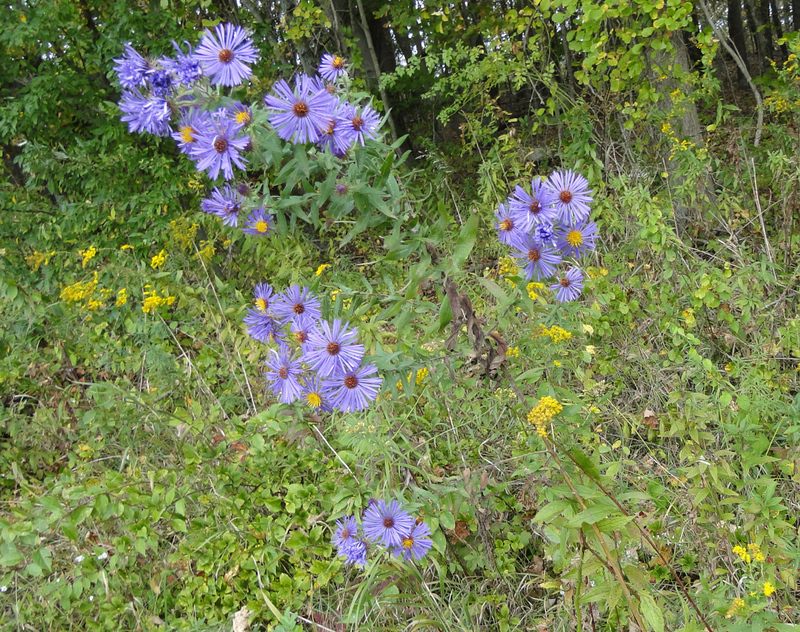 Pockets of wet meadow were rich in flowers, like New England Aster. 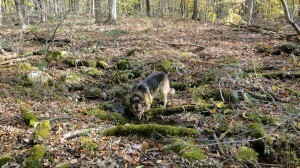 Drumlin fields make fine hunting territories for raptors like barred owl. Colorful wet meadow perched on top of drumlin. Multiple seasonal seepage wetlands and headwaters streams flow down drumlin hillsides. They are a valuable source of clean water for the drainage basin if the drumlin is undeveloped, they but may become conduits for construction runoff. There is more groundwater discharge on the nearly level sections of drumlin hillsides than on the steep sections. These are also prone to septic breakout. Only a small percentage of Connecticut’s soils are compact tills but a disproportionate share of construction site fiascos and problem-plagued new subdivisions occur on hardpan soils. Wet, silty, sticky hardpan soils, on drumlins and also in other landscape settings, can become a mire for heavy construction equipment because the snowmelt and spring rains “perch” on top of the hardpan. Saturated silty soils are highly erosive, often an erosion control nightmare. Flooding problems are more severe than on absorbent soils, and water pollution from lawns and septic systems becomes a problem at lower home densities. Break-out from home septic systems happens more often. With careful home and septic system placement, curtain drains, and appropriate landscaping, one can avoid some of these problems – but only if home densities are relatively low. Ironically, the loose upper soil layer of a drumlin is usually so shallow that it holds little reserve water during dry spells, so drumlin lawns need much irrigation in summer, though excess water is the problem in other seasons. Solutions: small lawns, partially wooded yards, and/or a meadow landscape with drought-tolerant grasses like Little Blue Stem, a.k.a. Poverty Grass. Could CTDEEP and our Conservation Districts provide land use boards, planners, and developers with more guidance on drumlins’ multiple constraints? On-line mapping (Web Soil Survey or WSS) available from the Natural Resource Conservation Service (NRCS) does show the approximate locations of seasonally wet, hardpan soil units, like the Paxton, Woodbridge, and Wethersfield soil series. More guidance is needed to make sure fertilizers and pesticides are not applied before or after heavy rains. This happens all the time in Connecticut suburbs! Turf chemicals tend to run off drumlin soils, more than off more absorbent soil types, especially when the soils are already soggy. Few understand that watercourse setbacks often need to be wider and septic system densities need to be lower on compact till soils, to protect down gradient wells, headwaters streams, pools, and lakes from excessive nitrogen, in nitrogen enriched groundwater and runoff. Because they reduce lot yields, these constraints need explanation in an official DEEP guidance document, preferably also in a CT Health Department memorandum! Clear-cutting may seem to be more economical for the developer, who should be warned that this is not wise on a drumlin! To minimize future “water woes”, maximize remaining tree cover when subdivisions are built. The reason is two-fold: 1) to slow the velocity of the falling rain, and 2) because trees spew thousands of gallons of water into the air as water vapor (transpiration), helping dry out those surface soils. After clear-cutting, a drumlin hillside that used to be wet only in March and April may stay wet to the surface though June – and before long, one will see the tell-tale mottles and grayish matrix color of a jurisdictional Connecticut wetland soil. Some, but not all engineers use underdrains and clay stops to prevent frost heave damage to roads and utility pipes, and to allow shallow groundwater to continue to seep down slope to wetlands that depend on this water source – instead of being shunted along roadbeds and sewer lines. Guidance is also needed in this area. Once aware of drumlins’ constraints and resources, town zoning boards will be able to guide development more appropriately, protecting valuable vernal pools and hillside streams, and at least a portion of the productive forests. For expansive overgrown fields on flat-topped drumlins, if the alternatives of farmland or grassland wildlife habitat are not possible, at least the damage to down-gradient headwaters resources, from a low density, large-lot residential community, with small lawns, will be much less than from a large, dense subdivision. This entry was posted in food chain, Native Landscaping, Soils, Water Quality, Wildlife Habitat. Bookmark the permalink.